Drug abuse – one of the major causes of deaths in America! According to Natural News, every day in the US, 2,500 youth (12 to 17) abuse a prescription pain reliever for the first time. In 2006 in the United States, 2.6 million people abused prescription drugs for the first time. A 2007 survey in the US found that 3.3% of 12- to 17-year-olds and 6% of 17- to 25-year-olds had abused prescription drugs in the past month. Prescription drug abuse, while most prevalent in the US, is a problem in many areas around the world including Europe, Southern Africa and South Asia. In the US alone, more than 15 million people abuse prescription drugs, more than the combined number who reported abusing cocaine, hallucinogens, inhalants and heroin. Deaths from drug overdose have been rising steadily over the past two decades and have become the leading cause of injury death in the United States. Every day in the United States, 114 people die as a result of drug overdose, and another 6,748 are treated in emergency departments for the misuse or abuse of drugs. 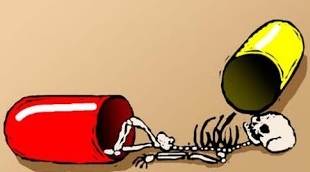 Nearly 9 out of 10 poisoning deaths are caused by drugs. Men were 59% more likely than women to die;whites had the highest death rate, followed by American Indians/Alaska Natives and then blacks;the highest death rate was among people 45-49 years of age; andthe lowest death rates were among children less than 15 years old, because they do not abuse drugs as frequently as older people. 82% were people 21 or older.